Prom/CAPE Guest Form: Stop in AP Office, Rm 12-001 to pick up a form. Forms due by April 24 . AFTER CAPE BREAKFAST: May 5 @ Calvary Church from 3:30-5AM A FREE breakfast for any student that was at CAPE. Baseball Meeting: There will be a baseball meeting today, April 9th, after school from 3:30-4pm in Rm 11-024. If you are in a Spring sport (track, soccer, tennis), attend your Spring sport practice and stop in and see Mr. Morgan in the AD Office (rm 11-005) during the school day. Juniors & Seniors: NEW DRESSES & SHOES JUST ADDED! FREE PROM attire — dresses, suit jackets, pants, shirts and shoes outside the Main Office – Rm 11-001. Check them out before school, during lunch or after school. Various sizes and styles. See Mrs. Borde with any questions. TONIGHT! 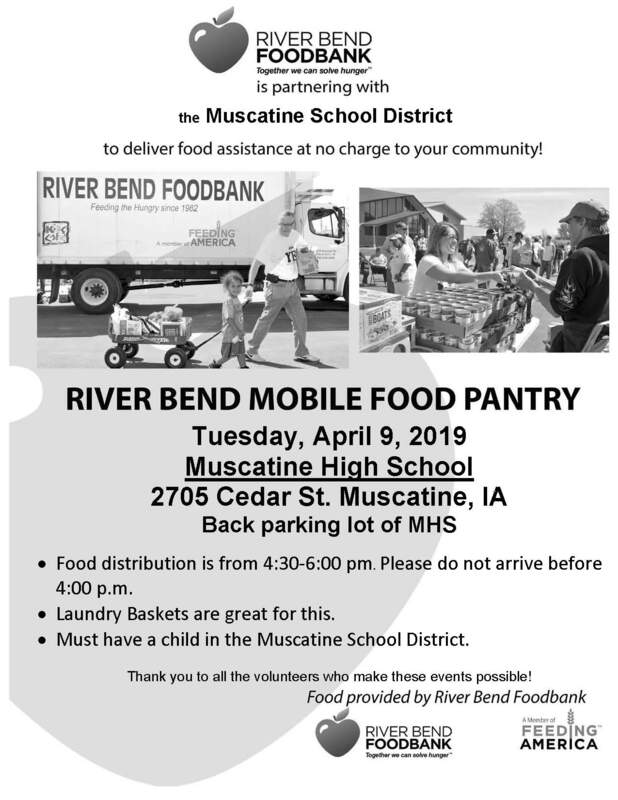 River Bend Mobile Food Pantry Coming to MHS Tuesday, April 9 from 4:30-6pm! Senior Final Exam Dates have been changed to Tuesday, May 21st and Wednesday, May 22nd. MHS LGBTQ club will meet in room 12-005 during Muskie Time on Thursday, April 11. Discussions for next year’s visions and goals will be the topic of the day. Please see Mrs. Kramer if you have any questions. Are you interested in hosting a student from another country? Students from France are looking for welcoming families to host them this summer from June 13 to July 7. Students come from a school near Lyon, France. They range in age from 14-16 years old and are part of a special program that concentrates on English (several of their classes are taught in English!). There are no scheduled group activities, as an effort is made to limit how many students come to each community. Students look forward to experiencing the daily life of their hosts and are expecting to speak only English while they are here. You/your family do not need to speak French–only English. To apply, go to www.languageandfriendship.com/login and use the Group ID AG14557. More information on the Hosting Program can be found online at: www.languageandfriendship.com/hosting Questions?? Talk to Mrs. Paulsen in room 23-017. Girls’ Basketball: There will be a meeting on Thursday during Enrichment in Ms. Hansen’s room for girls planning to play basketball next year. You can sign up in Adaptive Scheduler (“Girls Basketball”). We will go over the spring and summer open gym schedule. St. Ambrose Summer Camps. From engineering to piano, high schoolers can find something great to get them excited about learning! Find out more or register by going to www.sau.edu/summer! Students will complete hands-on projects to develop skills in team working, problem solving, and communication. Students will explore the marvels of human body anatomy using cadavers. The store will be open until April 10th. Contact Angie Draves mandadraves@yahoo.com or Stacey Beatty sbeatty29@gmail.com to RSVP. A Silent Auction will be available throughout the night! Email Bobbie Gerels bobbie@sinclairtractor.com if you have any items to donate to the silent auction. All proceeds support the Muskie Football Club. Players – check your school emails to sign-up to work. This is a required activity for MHS Soccer players! JUNIORS & SENIORS: Prom/Cape Guest Forms are available to be picked up in the AP office (12-001). Any student from another school, or a previous graduate under the age of 21, attending as a GUEST will need to complete a guest form. Current students must be a JUNIOR or a SENIOR in good standing. This form must be returned to the MHS Assistant Principals’ office by the end of the day on April 24, 2019. 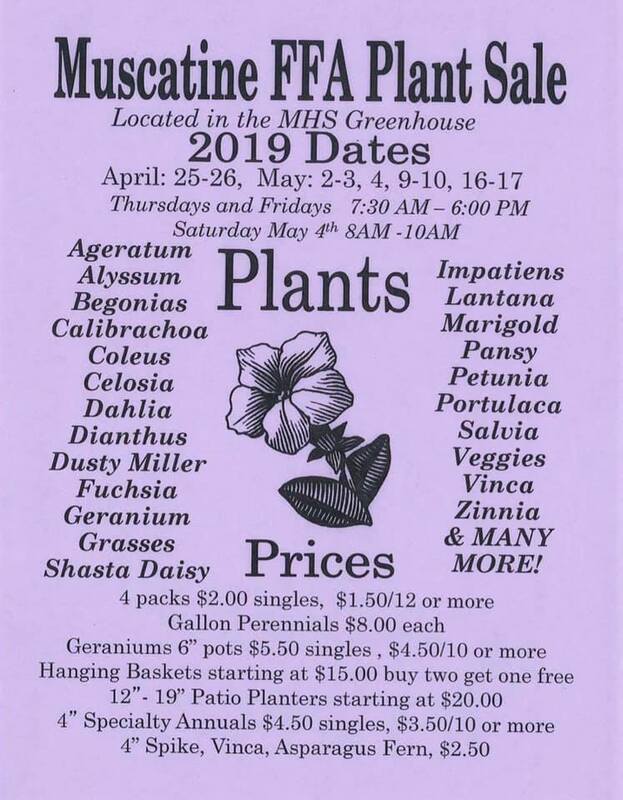 NO FORMS WILL BE ACCEPTED AFTER APRIL 24, 2019. Muscatine Wrestling Spring Open Mat Workouts! 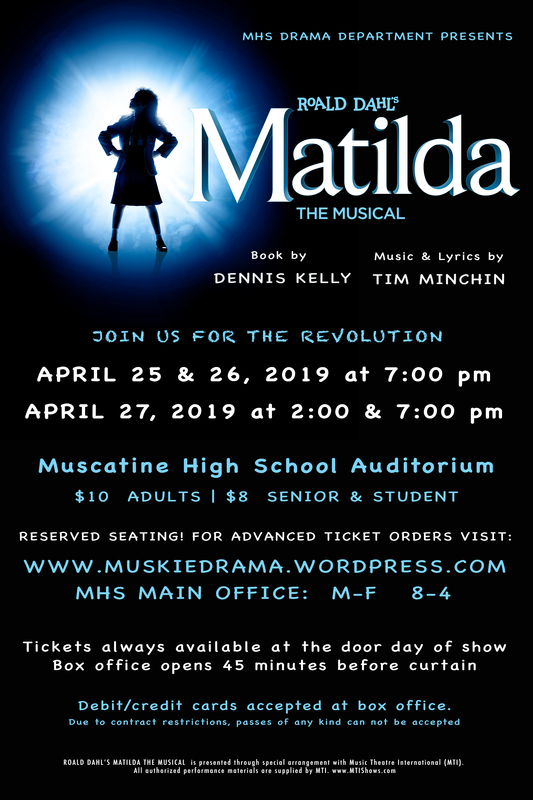 Available for all Muscatine high school and middle school students! Mon, Tues, Wed, Thurs 4:00-5:00 pm, Fridays 6:00-7:00 am in the MHS Wrestling Room. Key Club Blood Drive: Any MHS students or staff members interested in donating blood for the Micaela Brunson Memorial Blood Drive (hosted by Key Club) on Friday, April 12th need to sign‐up with a Key Club member or email Mrs. Keltner at jen.keltner@mcsdonline.org. Walk‐ins will NOT be taken for this blood drive ‐‐ all donors need to have a scheduled time between 8:00am-12:00pm. Seniors: If you have earned the Gallon Grad blood donation award (now called the IMPACT Award) by donating 8 times or are close (donated 6-7 times), email or stop into see Mrs. Keltner sometime in the next couple weeks. She needs to make sure your name is on the award list! Seniors/Parents: College funding random drawing giveaway for $1,000. Visit www.IowaStudentLoan.org/CollegeCosts to learn more and enter. Stepping Stones Learning Center LLC is in need of volunteers to help with their carnival on May 23rd. from 9:00am to Noon. Time slots are available if you can not work the full time. They also are looking for students to come read with their kids during the day. Contact Jacob Martin 563-264-1871 or email sslcmusca1dmin@gmail.com to sign up or for more information. Muscatine Heart Study located in the old Muscatine Hotel is looking for students to earn silver cord hours by helping them with their office work. Hours are flexible as they are open 10am-8pm Monday-Thursday. Contact 264-3886 for more information or to set up a time to work. Jefferson Elementary is looking for volunteers to work the Jefferson Carnival on Friday, April 12 from 430-7. Each volunteer will get a voucher for a piece of pizza and pop. If you are interested in helping out please email Sarah Manjoine at sarah.manjoine@mcsdonline.org.